The British graffiti master Banksy has been in New York for the past month, and Mayor Bloomberg has labeled him a vandal. How can he be a vandal when his art raises the value of the buildings, the building owners post guards to protect it or they’re able to remove the door or piece of wall and memorialize it? Bansky art has gone for $1 million-plus in recent auctions. I want him to come to Northwest Arkansas! After all, we have the Crystal Bridges Art Museum here. Can you imagine a Bansky stenciled piece on the outside wall of this great museum? It could draw even more visitors to our area. Of course, this masked artist would likely use that piece to take a jab at commercialism at the Walmartland museum. But Banksy pieces are often thought provoking. In 2005, when he was just becoming an international star, Banksy painted images on West Bank’s concrete wall in Israel. The stenciled pieces included two children with bucket and shovel, dreaming of the beach; a girl holding balloons floating to the top of the wall; and a boy with a ladder. In New York throughout October, he was putting out an art piece daily under the theme “Better In Than Out,” but that apparently stopped last week. His website said the project was canceled due to police activity. If Bloomberg won’t welcome him, I’d urge Rogers Mayor Greg Hines to offer an invitation. A Banksy mural would be much better than the retro Coca-Cola ad we have on the side of a building. I bet Hines would stop his code enforcement graffiti team from wiping away a valuable Banksy installation. 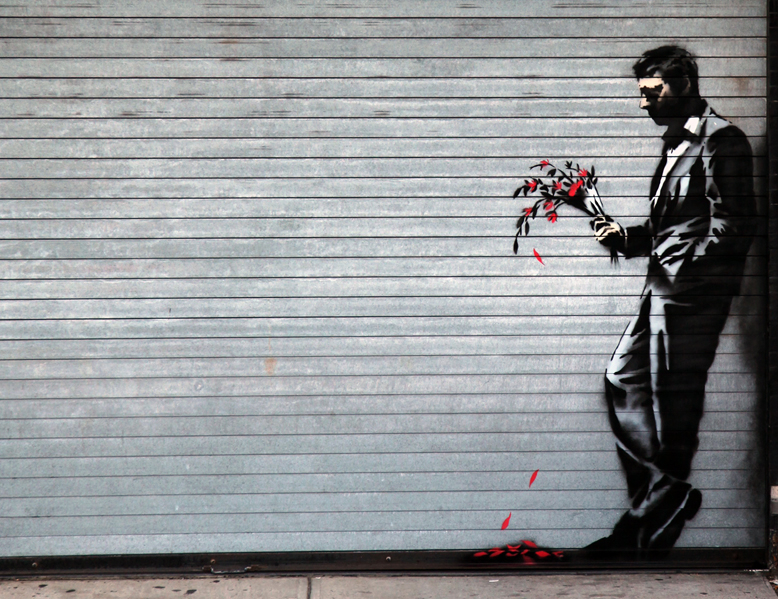 While in New York, he produced a fantastic stenciled piece of a man leaning against the wall holding flowers outside the Hustler Club. His tour has also included a replica of the Great Sphinx of Gaza made from smashed cinder blocks, and a mural of a small boy spray painting with a butler standing next to him holding out a tray of spray paint cans. Banksy’s unique art piece “The Crayola Shooter” is probably my favorite. 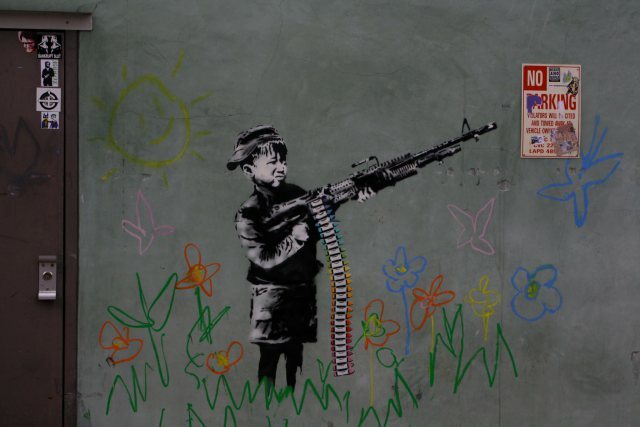 It was done in Los Angeles in 2011 and shows a child aiming a machine gun and using crayons for bullets. So come on Banksy, let’s see what you can do in these Ozark hills! This entry was posted in Observations and tagged Banksy, Coca-Cola, Crystal Bridges Museum of American Art, Graffiti, Hustler Club, Michael Bloomberg, New York, West Bank by Lori Ericson. Bookmark the permalink. Thank you. I’ll give it a try! Macky, Thank you for your kind words!